New items from Kloshar the Hat Maker have arrived to Santa Fe Dry Goods. As usual, each are handmade in Ibiza, Spain. While this is not our first shipment, we have received our first round of hats. For anyone unfamiliar with the brand, Kloshar was started by Alessandro di Carlo and Tiziano Rillo, both who now specialize in making hats, scarves, and accessories. With a distinct rugged aesthetic, scarves are created with a mix of fabrics. Because of the different weights, ranging from light and sheer to heavy, the pieces move and drape in unique ways. The hand-craft is apparent with large, irregular stitches made from large thread. Due to the subtle color combinations, burgundy red, khaki green, and denim blue are both versatile and unique. From flexible weaves to stiff canvas, each hat is the perfect blend of edgy and whimsical. 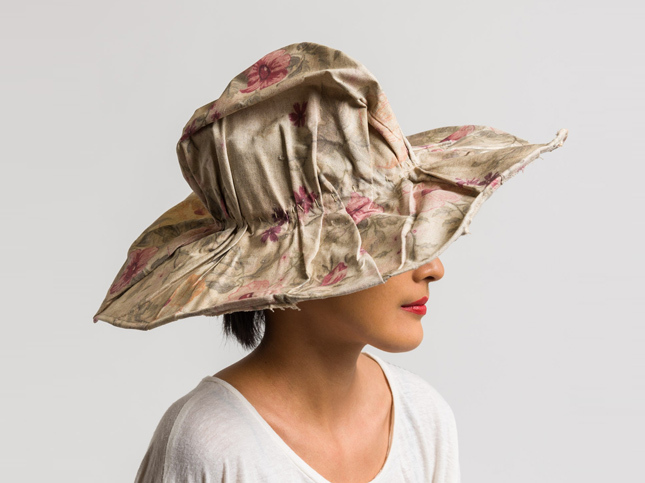 For example, the pastel floral print on canvas becomes a sun hat or a short brim version. While on the other hand, blue paper fibers are woven into a flexible hat, which completely adds style to any look. In conclusion, the collection is perfect for anyone with a distinct personality and style with appreciation for details.